Starting your DIY or renovations ? Once you have chosen the terracotta tile that is suitable for exterior use, it is essential to have a clean surface for a proper bond. It is recommended to clean the concrete with warm water and a suitable product such as a trisodium phosphate. Scrub well with a stiff brush and rinse well. If the concrete was previously sealed you will need to grind down the surface so the tile adhesives will bond. A scarifying machine may need to be rented to grind down the surface. If there are any cracks or surface damage ( large chips, or stairs with cracks running through them ) these will need to be simply repaired using a crack isolation membrane. Cut to size to ensure all damaged areas are covered, trowel thin-set onto the concrete filling any damaged area and push the membrane onto the thin-set smoothing it with the trowel. The terracotta tiles need to be washed down and allowed to completely dry either before or after Dry-laying but before sealing. 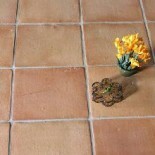 Dry-Lay all the terracotta tiles to plan the layout patterns and prepare for specials cuts that may be needed. Stack the tiles ahead of the laying area so you can work for longer stretches. Mix a thin-set mortar following the directions on the packet. Using a trowel apply the thin-set and the comb edge to create the grooves this will give the best adhesion to the terracotta. Place the tiles by gently sliding into place using 10mm spacers for consistent spacing. Note: When laying our Stoneware or Machine tiles the lines on the underside of the tiles should follow the same direction. Your base should already have a minimum of 1% run-off for rain water. If tiling steps start with the risers. Let the mortar cure overnight before grouting. Note: Remove any mortar that may have accidentally got on the terracotta tile surface immediately with water and sponge. If used, remove the tile spacers wherever possible before grouting. Handmade terracotta: Because this range is so porous sealing is needed before grouting and can even be done before laying, use an impregnating primer or sealer, if you are laying internally and want to darken the terracotta pre-seal with Boiled Linseed Oil. Once grouted final seal over tile and grout lines with your required finish following sealant instructions. Stoneware terracotta: Due to the low absorbs ion rates of our Stoneware range pre-sealing is not necessary but in both cases remove any grout that accumulates on top of the tiles as you work. Once grouted final seal over tile and grout lines with your required finish following sealant instructions. Slurry grouting is not advisable when working with terracotta. When grouting work in approximately 1-2m2 at a time, a tip if your grouting with a fine sand and cement mix ( which is best with terracotta tiles ) is to use a cement and mortar gun to apply the grout deep into the joints, use a rubber float to pack the joints finish the joints with a wet sponge or shaping tool. Clean away excess grout off tiles using water and a sponge, rinse the sponge repeatedly. Enjoy your floor for many years and be the envy of your friends!! This entry was posted on May 31, 2013 by Living Terracotta in Installation tips and tagged grouting, laying terracotta, sealing, terracotta on concrete, Terracotta tiles.